Set within the common areas of Palmetto Dunes are the Marriott and Hilton hotels, villas, shops, restaurants, and golf and tennis facilities. 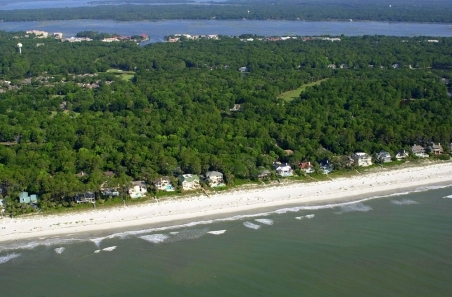 Within the private areas of Palmetto Dunes are the larger homes and additional facilities. Homesites within the community include oceanfront homes, wooded view, golf view, and lagoon view properties. The Arthur Hills Course is not only picturesque, but challenging. With ocean breezes, rolling dunes that create uneven golf lies and 10 holes sited on the water, precision play can be extremely important. The George Fazio Course was named for its famous designer but built with the help of his nephew, the highly regarded golf architect, Tom Fazio. It is ranked among America’s Top 100 courses. Get a taste of Palmetto Dunes with its Stay and Play package. See details below. Palmetto Dunes is truly set apart from other resorts in the Southeast. Surrounded by water with the Atlantic Ocean on one side and Shelter Cove Harbour on the other, the plantation’s 11-mile saltwater lagoon system provides a waterfront atmosphere throughout the entire community. At the same time, Palmetto Dunes’ location in the heart of Hilton Head Island puts all island conveniences right outside the front gate. > Palmetto Dunes, Hilton Head Island SC has an Albatross Golf Package that features outstanding resort accommodations plus three rounds of golf on your choice of three championship courses with over $500 in savings. Package features a special rate starting at $185 per person/per night and includes 4 days /3 nights in a 2-bedroom villa at Palmetto Dunes Oceanfront Resort, three rounds of golf on your choice of three championship courses (includes green fees and cart fees) with free replays (based on availability), complimentary range balls, one $50 Resort Gift Card to use at clubhouses and restaurants, and more. Send me more information about this Palmetto Dunes package! Palmetto Dunes, Hilton Head Island SC announced a special stay-and-play opportunity, the Golf Academy Package, with rates variable based on type of accommodation you select. The package includes 4 days /3 nights lodging, two days of 3-hour instruction sessions, two 9-hole rounds of golf after 2 pm at Arthur Hills or George Fazio courses, a video analysis emailed to you, lunch after lessons and unlimited practice range use. Send me more information about this Palmetto Dunes opportunity!